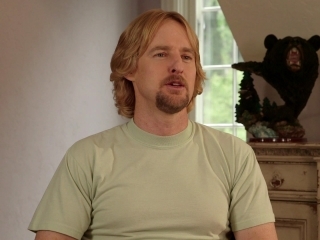 Director Jared Hess hit pay dirt in 2004 with the peculiar cult fave Napoleon Dynamite. Since then, he and his screenwriting partner (and wife) Jerusha Hess have been trying to repeat that level of success, with mostly middling results. Masterminds jettisons Jerusha, leaving Hess to direct his first feature written by outside screenwriters (Chris Bowman, Hubbel Palmer, Emily Spivey). The screwball crime comedy is based loosely on an infamous 1997 Loomis Fargo robbery committed by David Ghantt (who worked for the cash-handling company at the time). Based loosely enough, that is, to avoid a credit for Jeff Diamant, who wrote a book (Heist: The Oddball Crew Behind the $17 Million Loomis Fargo Theft) detailing the caper. Largely thanks to a game cast, Masterminds is passable featherweight entertainment. Its goofiest elements were apparently mostly fabricated by the filmmakers. They’re the weakest parts of the movie, which has tanked at the box office so thoroughly it makes one wish they had just stuck to the facts. A subtler movie, one that dug a little deeper than being just another story of dumb people doing dumb things, might’ve garnered better word of mouth. 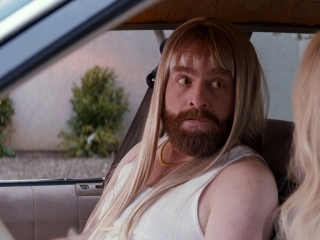 Zach Galifianakis struggles to find laughs beyond Ghantt’s ridiculous haircut, settling into a semi-one-note take that still manages to evoke a bit of sympathy. Hapless Ghantt, about to marry a woman he seemingly has little in common with, agrees to rob his employer in hopes of romance blooming between he and co-worker Kelly (Kristen Wiig). She and her boyfriend Steve Chambers (Owen Wilson) concoct the ludicrous plan in an attempt to pull off the biggest cash-only robbery in U.S. history. Things go south quickly (and rather predictably) as Ghantt hides out—post-robbery—in Mexico, slow to realize he’s never going to get his share of the $17 million nor win the heart of Kelly. While Wilson is largely wasted as the “brains” behind the heist, Wiig at least makes Kelly’s mixed feelings about deceiving Ghantt believable. The real wrong turn comes with the introduction of hitman Mike McKinney (Jason Sudeikis). Apparently McKinney is based on a real guy who was hired by Steve to kill Ghantt. But the filmmakers invent a bizarre subplot about Mike thinking Ghantt is his long-lost brother, separated at birth. The whole preposterous episode not only falls flat, it signals a ramping up of the lamest ‘action comedy’ cliches that comprise most of Masterminds‘ third act. 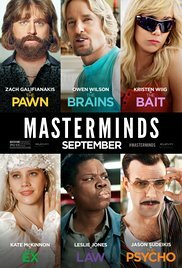 Fans of Saturday Night Live, take note: Masterminds was produced by Lorne Michaels and, in addition to previous SNL cast members Wiig and Sudeikis, also costars current SNL players Leslie Jones (as an FBI agent working the case) and Kate McKinnon. In another of the film’s serious missteps, McKinnon seems utterly lost in an ill-defined role as Ghantt’s space-case fiancee Jandice [sic]. Bottom line: go in with low expectations and Masterminds delivers some modest laughs. But it all might’ve resonated more deeply had the filmmakers stuck closer to the unique true story instead of abandoning it in favor of so much slapstick silliness. OVER Giveaway: COMET TV and CHARGE! – Space: 1999, Rocky, Godzilla, Funko Pop!